There are so many ways to hold your knitting needles and yarn and everyone seems to have their own style. I'd like you to keep in mind though, that it does take awhile to feel comfortable knitting so it's completely fine to wait until you feel more settled with it all. 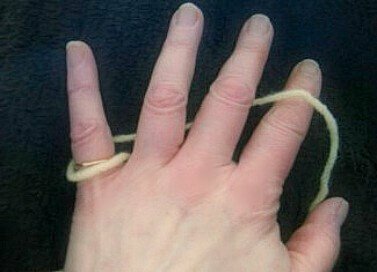 And most likely, learning how to hold knitting needles will happen over time as you keep practicing. 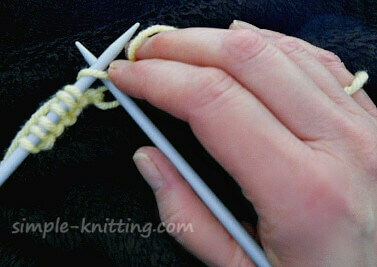 You may in fact develop your own way of doing it all by yourself as you carry on learning to knit. Sometimes is just happens that way. As you relax more with knitting it will all become automatic in a way. Of course it's always nice to see how someone else does it right? All right then, I'll give you some ideas on how to hold your needles and yarn and then you can try some ways on your own. It's a matter of personal preference. Once you start knitting and developing a nice knitting rhythm you'll find your own perfect and unique way. At first it will feel a little awkward so just give yourself a little time. You'll get it! In the second set above they're being held like pencils. You can try both or mix them up a bit or just simply create your own unique style. 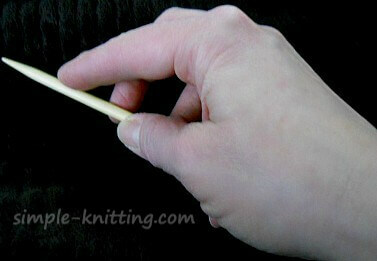 My left hand steadies the needle and my forefinger helps to guide the knitting stitches. 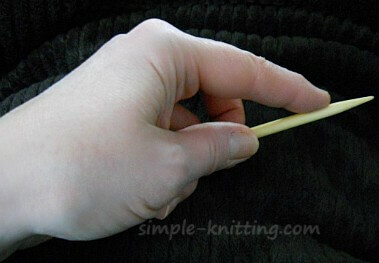 I hold the right needle between my thumb and forefinger and my hand is slightly over the needle. A lot of people will stick the yarn over their forefinger on the right hand photo but somehow I got used to knitting with the yarn going over my middle finger instead. Sometimes I tuck the right needle under my arm. But that's me. There's no right or wrong way so experiment with it and see what works better for you. There are just as many ways to hold your knitting yarn too! It all comes down to comfort. You will have to decide which knitting method you want to use though. The two most common are the English knitting method and the Continental knitting method. I'm left-handed and I knit the English knitting method or right-handed way. The English knitting method means that your right hand will be moving the knitting needle through the stitches on your left hand needle. 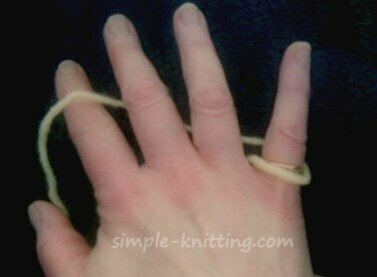 If you decide to wrap the knitting yarn around your fingers you will wrap the right hand. Here are two ways to try. See if one of them works for you. 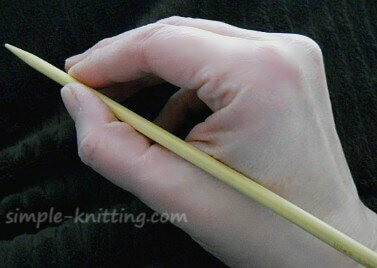 The Continental knitting method means that your left hand will be moving the knitting needle through the stitches on your right hand needle. 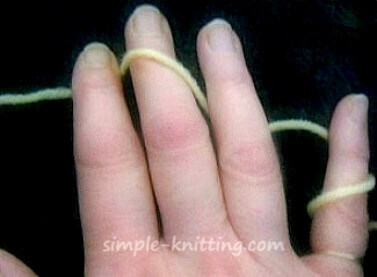 And if you decide to wrap the knitting yarn around your fingers you will wrap the left hand. Here are two ways to try. Just experiment. 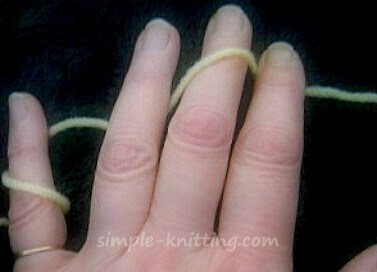 Some knitters don't even bother winding the yarn around their fingers. So don't feel that you have to do this. Once you've been knitting awhile your way will become the way that works for you. Everyone does it a little differently. Which knitting style should you choose? You might want to try both knitting methods to see which one is more comfortable. Once again, it's going to feel awkward at first so take your time in finding the knitting method that you like. 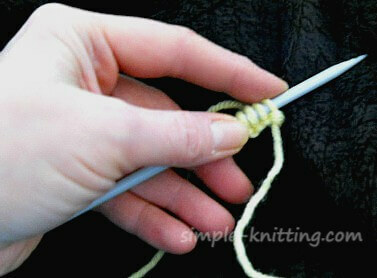 Learning to hold your knitting needles and yarn takes practice and patience so don't worry too much about it for now. Just start knitting - you'll get it. To help you along a bit I found two knitting videos for both styles of knitting (English and Continental) that will show you a couple of ways to hold your yarn. Please don't feel that you have to learn how to hold your knitting needles and yarn. There really isn't one way to do it. A lot of people simply knit the way that makes them feel comfortable and that's what I want you to do as well. Over time you'll develop your own style. Would you like to go back and review anything on my beginning knitting page? Do you want a break? 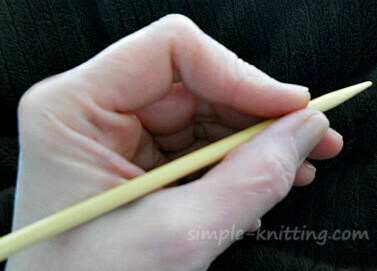 Go grab a cup of tea, come back and have a peek through some of my favorite basic knitting tools. I just love them and I think you will too. They're always fun to look at!